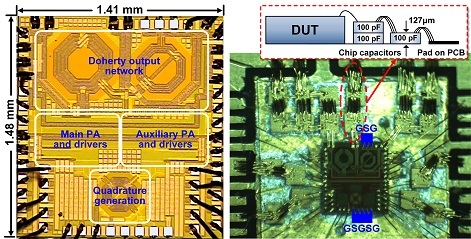 This is a digital polar Doherty PA fully integrated in a 65nm bulk CMOS process. This design achieves superior back-off efficiency enhancement, and its unique in-field reconfigurablity offers robustness against antenna impedance variations. S. Hu, S. Kousai, J. 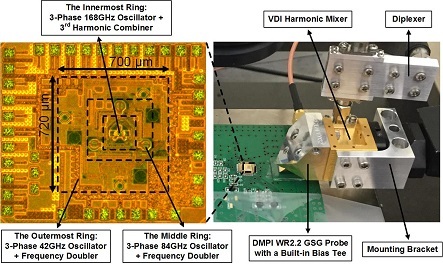 Park, O. Chlieh, and H. Wang, “A +27.3dBm Transformer-Based Digital Doherty Polar Power Amplifier Fully Integrated in Bulk CMOS,” IEEE Radio Frequency Integrated Circuits (RFIC) Dig. Tech. Papers, Jun. 2014. --- This paper won the 2014 RFIC Best Student Paper Award (1st Place). 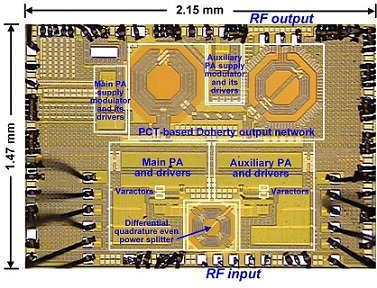 Doherty Power Amplifier Fully Integrated in Bulk CMOS,” IEEE J. of Solid-State Circuits (JSSC), vol. 50, no. 5, pp. 1094 – 1106, May 2015. --- Top 13 Most Frequently Downloaded Documents for IEEE Journal of Solid State Circuits (JSSC) in May 2015. This is a hybrid mixed-signal Class-G Doherty PA design fully integrated in a 65nm bulk CMOS process. It leverages the joint operation of Class-G and Doherty PA techniques and achieves the best PA efficiency enhancement in deep power back-off among reported CMOS PAs without using any switches at PA RF output. This unique mixed-signal PA architecture also enables highly linear and broadband Doherty operations. S. Hu, S. Kousai, and H. Wang, "A Broadband CMOS Digital Power Amplifier with Hybrid Class-G Doherty Efficiency Enhancement,” IEEE International Solid-State Circuits Conference (ISSCC) Dig. Tech. Papers, Feb. 2015. S. Hu, S. Kousai, and H. Wang, “A Broadband Mixed-Signal CMOS Power Amplifier with A Hybrid Class-G Doherty Efficiency Enhancement Technique,” accepted and to appear in IEEE J. of Solid-State Circuits (JSSC), 2016. 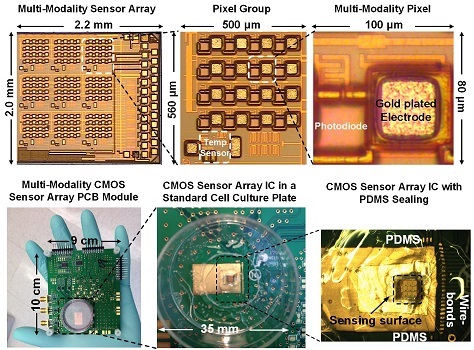 This is the world first fully integrated multi-modality CMOS cellular sensor array with four different sensing modalities for holistic real-time joint-modality cellular characterization. The sensing modalities include extracellular voltage recording, cellular impedance mapping, optical detection (shadow imaging/bioluminescence sensing), and thermal monitoring. Our GEMS group proposes and pioneers the concept of multi-modality sensing for holistic cellular characertization. The potential applications include massively parallel drug development, chemical screening, personalized medicine, high throughput stem cell characterization, cancer cell monitoring. J. Park, T. Chi, J. Butts, T. Hookway, T. C. McDevitt, and H. Wang, "A Multi-Modality CMOS Sensor Array for Cell-Based Assay and Drug Screening,” IEEE International Solid-State Circuits Conference (ISSCC) Dig. Tech. Papers, Feb. 2015. 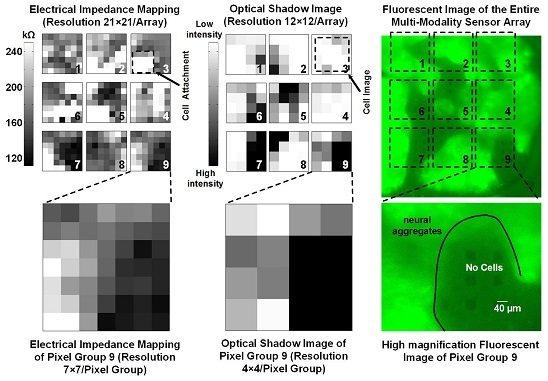 T. Chi, J. S. Park, J. C. Butts, T. A. Hookway, A. Su, C. Zhu, M. P. Styczynski, T. C. McDevitt, and H. Wang, “A Multi-Modality CMOS Sensor Array for Cell-Based Assay and Drug Screening,” accepted and to appear in IEEE Trans. Biomed. Circuits Syst. (TBCAS), Dec. 2015. This is a 500GHz signal source fully integrated in a 90nm SiGe process. It utilizes a unique multi-phase sub-harmonic injection locking technique to substantially extend the system frequency tuning range. It demonstrates a total 5.1% frequency range from 485.1 GHz to 510.7 GHz and an output phase noise of -87 dBc/Hz at 1 MHz offset, achieving the largest frequency tuning range and the best phase noise among the reported Si-based THz oscillator sources at 0.5 THz. T. Chi, J. Luo, S. Hu and H. Wang, "A Multi-Phase Sub-Harmonic Injection Locking Technique for Bandwidth Extension in Silicon-Based THz Signal Generation,” IEEE Custom Integrated Circuits Conference (CICC) Dig. Tech. Papers, Sep. 2014. --- 2014 CICC Best Student Paper Award Finalist. T. Chi, J. Luo, S. Hu, and H. Wang, “A Multi-Phase Sub-Harmonic Injection Locking Technique for Bandwidth Extension in Silicon-Based THz Signal Generation,” IEEE J. of Solid-State Circuits (JSSC), vol. 50, no. 5, pp. 1861 - 1873, Aug. 2015. Last revised on Dec 30, 2015.